Since the start of 2017, several new staff members have joined the Digital Services Section. All of us will be making regular blog posts on History For All the People, so we thought it would be nice for each of us to introduce ourselves, describe our roles in DSS, and preview the projects we’re working on. I’m starting my fourth week with the State Archives of North Carolina. It’s an interesting time in this latest chapter of my work history. Things are starting to come together, and I feel like I’m getting to the point where I can contribute to the team here, instead of spending all my time asking questions. One of the reasons I was excited to start working here was that I knew I’d get to handle all sorts of fascinating historical documents in the course of digitizing them and making them available for access online. The course of my career in libraries and archives is approaching thirteen years (which is a little scary when I sit down and think about it), and I’ve spent much of that time working with digital collections. I started out as a baby librarian doing work for the Milwaukee Public Library. Yes, that’s Milwaukee, Wisconsin, home of beer, brats, and cheese. I’m not from there originally, but that’s where I had my first job fresh out of library school. I was assigned to work in the Humanities Department, a subject unit at the Central Library that worked mainly with local history and genealogy materials. After not too long, I found myself in charge of the Historic Photo Archives there, which led to my first forays in digitization. Eventually, I would become the Digital Projects Librarian, and our digital collections really started to take shape. One of the things I really loved about my work at MPL was how much I learned about the history of the city. Before too long, I had in-depth knowledge of Milwaukee that rivaled that of most life-long inhabitants. From there, I went to work at Marquette University, also in Milwaukee. In fact, I moved about six blocks west down Wisconsin Avenue. My job there was similar to what I’d been doing for MPL, except the focus was different. Instead of making Milwaukee’s historical materials available, I was working on making the research output of Marquette’s faculty and students more easily accessible. I learned new techniques, got to work with different formats and equipment. It was interesting and important work, and I learned a lot, but I missed the parts where I got to learn about the history of the city. This is why I’m so happy to be working here. Once again, I find myself somewhere where I’m a stranger. As a Canadian by birth, this is as far south as I’ve ever lived. So not only am I learning a lot about North Carolina, but I’m also learning about the South. The stories I’m running across as I work with documents from the General Assembly during the Revolutionary War are deeply fascinating, and I’ll be sure to share some of the tidbits I find. I’m also working with an unprocessed collection of documents relating to the Future Homemakers of America, and I’m rapidly learning more about that organization (established in 1945, segregated until 1965, details to come). I’m eager to learn even more about the state I now call home, and to see how I can use that knowledge to make its treasures available to the public. This entry was posted in News and tagged Digital Services Section, staff profiles on June 21, 2017 by rosefortierncdcr. My first few weeks here have been a whirlwind of excitement, and I’m so happy to be here! I am a homegrown Tar Heel, grew up in Raleigh, and completed my BA in Communication Studies with a minor in English from UNCW. I also received my MLIS from Florida State University, which I completed through online courses. I look forward to working in Digital Services and undertaking associated challenges brought about by issues surrounding information lifecycle management, long-term retrievability, and access. Before coming to the State Archives, I would say I’ve kept fairly busy in searching for my “place.” Like most in this field, I feel as though I have had many different past lives before focusing on archival work—I guess that’s what happens when you have a wide variety of interests pulling you in several different directions. I first fell in love with photography as a teenager, and decided I would give news photography a try at my college newspaper, which later led me into a photographer position post-college at a newspaper in Kinston, NC. I fell in love with telling stories through the art of photography, but never truly felt like it was the career path for me. Straight out of college, I side-tracked into a part-time position at a small publishing company due to my minor in English and interests in editing/writing—also not quite the desired career path for me. I then interned for a few months at NCMA in the Education Department to see if working with art as opposed to creating art was a better option for me. This experience led me to explore other opportunities in the world of art and photography, and I began two simultaneous internships at the National Archives II in College Park, MD and Magnum Photos in NYC—all while working on my MLIS. I might not have had much time to sleep, but that didn’t seem to matter at the time. This entry was posted in Digital Services, News and tagged Digital Services Section, North Carolina Digital Collections, staff profiles on May 16, 2017 by Sara. Today we introduce Jennifer Blomberg, head of the Collections Management Branch. Describe your job at the State Archives. I am the Head of the Collections Management Branch for the Archives. The Collections Management Branch provides archival and records management services for public officials and the citizens of the state including duplication of records upon request, preservation reformatting of public records, and provision for storage of security microfilm. I plan, direct and oversee the preservation programs for the Archives and Records and directly supervise the Conservation, Imaging and Photography Units. I assure appropriate conservation treatments, preservation, duplication and quality assurance of microforms and photographic negatives and prints. Some of my job responsibilities include collections assessments and storage, environmental monitoring, integrated pest management, collections security, development of policies and standards for storage and disaster mitigation, preparedness and response. I am excited to be able to start to work on the Archive’s disaster mitigation, preparedness and response activities. I will be working on an evaluation and revision of the current plan, evaluating supplies, and implementing training for staff on disaster mitigation and disaster response actions. How long have you worked at the State Archives/Records Center? I am a fairly recent hire for the State Archives. I have only been in my current position, and at the Archives, for about five months now. Describe your educational or career background prior to working here. I have a Masters of Library and Information Science with a specialization in Archives, Preservation and Records Management from the University of Pittsburgh, School of Information Sciences. I hold a Bachelors of Arts from the University of Delaware with a concentration in Conservation and Collections Care. I have worked at various cultural institutions including museums, art galleries, historical societies, libraries and conservation labs doing a wide variety of preservation conservation functions. Prior to coming to the Archives, I worked at Duke University in their conservation lab and preservation department. This entry was posted in News, Preservation and Conservation and tagged Collections Management Branch, staff profiles on March 10, 2014 by Aaron. Continuing our staff profile series, today we present Tammy James, the Imaging Unit Supervisor in the Collections Management Branch of the Collections Services Section. Describe your current job at the State Archives. I answer many emails and phone inquiries daily, this may involve searching for holdings, missing records, duplication orders, billing questions, and questions concerning progress of present projects. Schedule projects for my staff, accession microfilm into our holdings. Collaborate with various Department staff. What project(s) have you completed recently, are currently working on, or have coming up? My unit has recently completed a very large project for SBI which included 400 cubic feet of records. How long have you worked at the State Archives? I have been at the Archives for 14 years. I was a Processing Assistant IV which included microfilming, then I was a Processing Assistant V which included accessioning microfilm holdings of various types of records. I have been in my current position for 12 years. Are you involved in any committees, special projects, DCR-wide programs, or professional organizations? I am involved in the DCR Combined Campaign. 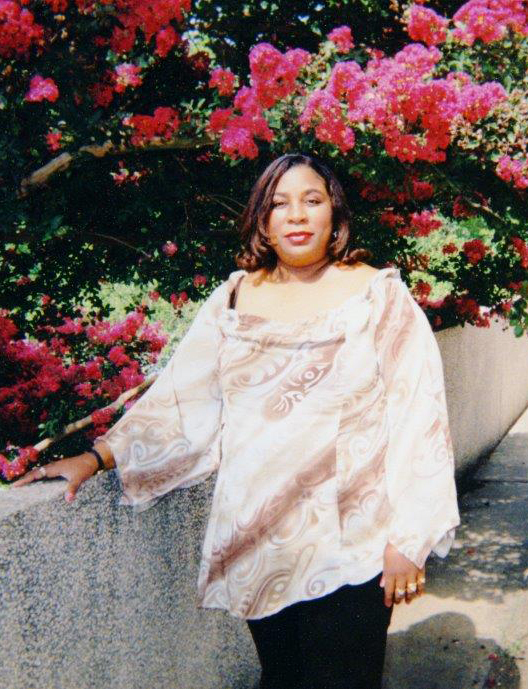 I am a member of the DCR Diversity Choir, Participated in the Leadership Development Program 2012-2013, on the Friends of the Archives Committee and EEO Committee. I am also on the Graduation Committee for the LDP. I attended Wake Technical Community College. I was a Team Leader of the Microfilm Unit at SMI Imaging for 17 years. Working with the public and answering questions about holdings, billing, vendor lists, student transcripts etc. What skills or traits do you think are needed to be successful at your job? Attention to detail, multi-tasking, creativity, technology, coaching, researching, monitoring, collaboration, quality control. Is there an aspect of your job that you never thought you would end up doing? Maintenance on equipment and freezing in the vaults. What work-related accomplishment are you most proud of? Have you received any specialized training, certifications, awards, or recognitions? I have received my Associates Degree in Biblical Studies and continuing the work towards my Bachelor’s Degree. I have received Certificates in many Computer Programs being used in my job on a daily basis. What’s the most interesting/unusual thing you’ve come across in a collection? Nothing too interesting but at my previous job we were prepping records and found dollar bills in every folder where people pulled records to copy and paid leaving the money in the folder. Too bad we didn’t get to keep what we found, HA HA. What’s the most interesting reference question you’ve been asked? I recently received a call from a customer that he was having problems with his reader printer and wanted me to come out and fix it. We don’t do maintenance on outside equipment. This entry was posted in News and tagged Collections Management Branch, staff profiles on August 6, 2013 by Aaron. Today we present Tiffanie Mazanek from the Digital Services Section. I work on a multitude of different things, but the things I work on most often are indexing our Secretary of State Land Grants, adding materials to our Digital Collections, and designing promotional materials for the State Archives. We just finished and published our newly designed and updated State Archives newsletter, The Charter. The DCR Educational Committee is releasing a new search tool that will enable students and teachers to search all DCR’s digital resources. The DCR Educational Resources Portal is available on the NCDCR website and will be officially launched this late summer. I am currently working on the Rosenwald Papers to be included in our Digital Collections as part of the Early African American Education Collection. I have just reached the five year mark. Are you involved in any committees or DCR-wide programs? State Archives Civil War 150 Committee and the DCR Education Committee. My first career had nothing to do with history. I worked for 13 years at Victoria’s Secret as a store manager, leaving shortly after the birth of my daughter. After about three years out of the work force I took a job at the State Archives as a part time temporary employee working on the North Carolina Newspaper Digitization Project. At the end of that project I was able to acquire a full time position. I believe my love of history, my degree in Graphic Design, and my understanding of branding and public service brings a fresh perspective to the State Archives. The State Archives of North Carolina has such a treasure trove of information and I enjoy getting that information out to the public, especially to our educators. I believe it is so important that our children know about the past, one can learn so much from history. I find working with our digital collections immensely satisfying, being able to get the great primary resources the State Archives has online and easily accessible to the general public via the web. I also enjoy designing and developing promotional materials for the State Archives, being able to utilize my graphic design background to help promote an agency such as the State Archives is rewarding and fun. Attention to detail is a must and being able to multitask. What’s the most interesting or unusual thing you’ve come across in a collection? One of my job duties is to index pertinent information from the Secretary Land Grants, in this indexing I come across some fun names, just this week I came across the name Rice Coffey some other notable names include Ice Snow, and an all-time favorite Bold Robin Hood. Do you have a favorite collection or set of records? I really enjoy working with the Private Collections. By the end of working on a private collection I almost feel like I know the people. A good example of this is with the Burgwyn Papers. I had the opportunity to scan, transcribe and index William Burgwyn’s diaries and many of his personal letters. The letters and diaries were primarily from the time he served in the Civil War. I found it interesting to see how he matured as the years went by. His first diary was started in 1861 and he was only 18 years old and last diary ends in 1865 at the age of 22, in this four year time frame he had lost his older brother, was seriously wounded, and captured by Union Forces, not to mention partook in numerous battles and saw many of his friends and colleagues die. Burgwyn’s papers are available in the digital Civil War Collection as well as many other letters, some of which brought tears to my eyes. This entry was posted in News and tagged North Carolina Digital Collections, staff profiles on July 2, 2013 by Aaron. Our staff profile series continues with Carie Chesarino of the Government Records Section, Records Analysis Unit. As a records management analyst, my day-to-day in the Government Records Section varies widely. Primarily, I serve as a resource for government employees figuring out how to organize, preserve, make available, and/or destroy their office’s records. I advise on retention periods, the Public Records Law, confidentiality, electronic records management, and archival appraisal. I also help coordinate the security microfilming of major decision-making boards’ meeting minutes from across the state. The meeting minutes of town, city, and village councils as well as county boards of commissioners record North Carolina’s rich history. Hence, we ensure that these records are preserved so future generations may access explanations for how and why their city, town, village, county, or agency developed the way it did. How long have you worked for the Division of Archives and Records? I started in April 2012. I have a heavily liberal arts background. I graduated with a B.A. from John Carroll University–The Jesuit University in Cleveland–in 2009 with majors in history and German studies and minors in philosophy and modern European studies. I followed that with a M.A. in public history from North Carolina State University, which concentrated on American history and archival studies. Finally, I recently completed a M.S. in library science from UNC-Chapel Hill, where I studied archives and records management as well as digital libraries. Previously I worked and interned as a student archivist at the following repositories: North Carolina State University’s Special Collections Research Center; University of North Carolina at Chapel Hill’s Southern Historical Collection; and the Smithsonian Institution’s Archives of American Gardens. Besides the sheer variety of job duties, it is truly rewarding to work as a consultant for public employees. More often than not, they are generous with their gratitude and quick to help me out when I have questions. I work with microfilm so much. As a millennial–even as one who wanted to work at the Archives–I never fully appreciated the value and sustainability of microfilm as a storage medium until now. The State Archives has quite the treasure trove of information available on these innocuous reels. What would you want people to know about our collections or services that may not be widely known? The State Agency records have tons of interesting information – of particular interest to me are the records in the Department of Public Instruction’s related to the construction and administration of African American schools. Something I have had to get used to is translating research topics into government functions in order to find records. In a similar vein, researchers should feel comfortable turning to Public Services archivists with help in determining which records series correspond to their research interests. This entry was posted in News and tagged staff profiles on June 24, 2013 by Aaron. 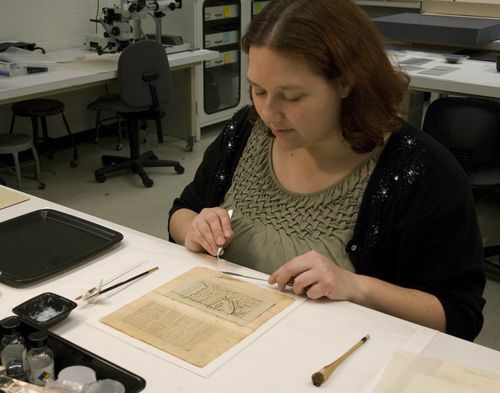 Meet Emily Rainwater, Conservator in the Collection Services Section. As the sole Conservator, I am responsible for the physical preservation of all of the permanent collection material in the Division of Archives and Records. It’s a lot! I spend a lot of my time treating items that are badly damaged, such as torn documents, books with detached cover boards, or panoramic photographs that are too tightly rolled to be viewed safely. I also take calls from the public and other state record custodians and give advice on the best way to care for and preserve their own treasures. Recently, I treated some torn documents that were part of the Frankie Silver murder case (http://www.northcarolinahistory.org/encyclopedia/833/entry/). I also stabilized an extremely damaged volume of session minutes from the Longstreet Presbyterian Church, allowing it to be digitized (http://digital.ncdcr.gov/cdm/ref/collection/p15012coll1/id/67372). I have an on-going project to unroll and flatten black and white panoramic photographs from WWI and WWII. I also have some broken glass plate negatives that need a specialized, custom housing constructed. July 15th will be my one year anniversary. I am the 2013-2014 Program Chair for the Book and Paper Specialty Group of the American Institute for Conservation of Historic and Artistic Works (AIC), which is the professional organization for Conservators. I have a BA in Ancient History and Classical Civilizations from the University of Texas at Austin. I also have a Masters of Science in Information Studies (MSIS) with a Certificate of Advanced Study in the Conservation of Library and Archival Materials, also from the University of Texas at Austin. Conservation is an amazing mix of using your brain to analyze a problem, but also using your hands to actually fix that problem. I love being able to put something back together again so that it is usable today, tomorrow, and 500 years from now. Plus, I get to see all the really unusual and interesting collection material! Conservators must have excellent manual dexterity and hand-eye coordination to be able to carry out extremely delicate, detailed work. A good conservator also has to be okay with a certain amount of repetition. I’ve spent weeks mending every single hole greater than 1mm in a 600+ page volume that had previously been a tasty snack for some devious insects. You have to be passionate about your job and believe in the importance of the work you do. Conservators tend to think we have the best job in the world. Dealing with bugs. I still get thoroughly grossed out by cockroaches and silverfish and creepy crawly things, but I also know how to trap them with tape and then hold on to the body to show the building’s pest manager and assess whether or not they are a threat to your collection. What’s the most interesting thing you’ve come across in a collection? As an undergraduate, I volunteered in the Preservation Lab of the Harry Ransom Humanities Research Center. The “Leatherface” mask from the original Texas Chainsaw Massacre movie came in one day needing a new box. “What does this smell like to you?” Unfortunately, the answer was skunk. Circulating collections at a University Library are an adventure! You would be surprised how many times a conservator gets asked to give something a sniff test. Before coming to work at the Archives, I completed a post-graduate fellowship at the Smithsonian Institution’s National Museum of American History working on the year-long conservation treatment of Thomas Jefferson’s Bible. The Jefferson Bible is a unique assemblage of passages that were hand cut and pasted onto blank sheets of paper by Jefferson himself. Beyond the thrill of working with an object so personal to Jefferson, I’m really proud of how the project continued to highlight the importance of conservation. You can read more about it here http://americanhistory.si.edu/jeffersonbible/. This entry was posted in News and tagged staff profiles on June 17, 2013 by Aaron.